R. M. Ballantyne : The Coral Island, 1858. Ballantyne, R.M. : The Coral Island. circa early 1940s, Number 23 in the Dean's Classics' series. T. Nelson and Sons, London, 1858. 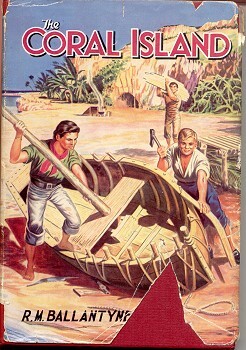 While Ballantyne did not travel to the Pacific Islands before writing The Coral Island, the text clearly indicates that he read extensively on the subject before writing his classic boy's adventure novel. This would not have been evident to most 19th century readers. Wikipedia notes: "...because of one mistake he had made in The Coral Island, in which he gave an incorrect thickness of coconut shells, Ballantyne would travel all over the world to gain first-hand knowledge of his subject matter and to research the backgrounds of his stories." For his account of Polynesian surfriding (page 175) he probably read, at least, the published accounts of Cook's marineers in the Hawaiian Islands (see Source Documents Hawai'i 1778 and Hawai'i 1789) and Rev. 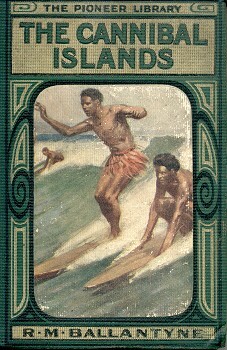 Ellis' reports from Tahiti and Hawaii (see Source Documents Surf-riding in the Society and Sandwich Islands). In particular, Ballantyne's remarks on swimming and diving (page 174) are probably derived from Ellis. It is also evident that he read Charles Darwin's Journal and Remarks 1832-1835 (published 1839, commonly titled The Voyage of the Beagle or Journal of Researches) as Chapter XI's analysis of the volcanic formation of coral islands has similarities with Darwin's ground breaking research, see below. But the amusement which the greatest number of the children of both sexes seemed to take chief delight in was swimming and diving in the sea, and the expertness which they exhibited was truly amazing. They seemed to have two principal games in the water, one of which was to dive off a sort of stage which had been erected near a deep part of the sea, and chase each other in the water. Some of them went down to an extraordinary depth; others skimmed along the surface, or rolled over and over like porpoises, or diving under each other, came up unexpectedly and pulled each other down by a leg or an arm. They never seemed to tire of this sport, and from the great heat of the water in the South Seas, they could remain in nearly all day without feeling chilled. Many of these children were almost infants, scarce able to walk; yet they staggered down the beach, flung their round, fat little black bodies fearlessly into deep water, and struck out to sea with as much confidence as ducklings. The other game to which I have referred was swimming in the surf. But as this is an amusement in which all engage, from children of ten, to grey-headed men of sixty, and as I had an opportunity of witnessing it in perfection the day following, I shall describe it more minutely. I suppose it was in honour of their guests that this grand swimming-match was got up, for Romata came and told the captain that they were going to engage in it, and begged him to come and see." "What sort of amusement is this surf-swimming?" I inquired of Bill, as we walked together to a part of the shore on which several thousands of the natives were assembled. ... replied Bill, giving a turn to the quid of tobacco that invariably bulged out of his left cheek. "Ye see, Ralph, them fellows take to the water as soon a'most as they can walk, an' long before they can do that anything respectably, so that they are as much at home in the sea as on the land. Well, ye see, I s'pose they found swimmin' for miles out to sea, and divin' fathoms deep, wasn't exciting enough, so they invented this game of swimmin' on the surf. Each man and boy, as you see, has got a short board or plank, with which he swims out for a mile or more to sea, and then, gettin' on the top of yon thunderin' breaker, they come to the shore on the top of it, yellin' and screechin' like fiends. It's a marvel to me that they're not dashed to shivers on the coral reef, for sure an' sartin am I that if any of us tried it, we wouldn't be worth the fluke of a broken anchor after the wave fell. But there they go! " As he spoke, several hundreds of the natives, amongst whom we were now standing, uttered a loud yell, rushed down the beach, plunged into the surf, and were carried off by the seething foam of the retreating wave. At the point where we stood, the encircling coral reef joined the shore, so that the magnificent breakers, which a recent stiff breeze had rendered larger than usual, fell in thunder at the feet of the multitudes who lined the beach. For some time the swimmers continued to strike out to sea, breasting over the swell like hundreds of black seals. Then they all turned, and watching an approaching billow, mounted its white crest, and each laying his breast on the short flat board, came rolling towards the shore, careering on the summit of the mighty wave, while they and the onlookers shouted and yelled with excitement. Just as the monster wave curled in solemn majesty to fling its bulky length upon the beach, most of the swimmers slid back into the trough behind; others, slipping off their board, seized them in their hands, and plunging through the watery waste, swam out to repeat the amusement; but a few, who seemed to me the most reckless, continued their career until they were launched upon the beach, and enveloped ill the churning foam and spray. One of these last came in on the crest of the wave most manfully, and landed with a violent bound almost on the spot where Bill and I stood. ... entertained as their guest. The sea-water had removed nearly all the paint with which his face had been covered, and as he rose panting to his feet, I recognised, to my surprise, the features of Tararo, my oId friend of the Coral Island. Besides this, I noticed that on the summit of the high mountain, which we once more ascended at a different point from our first climb, were found abundance of shells and broken coral formations; which Jack and I agreed proved either that this island mnst have once been under the sea, or that the sea must once have been above the island. ... could not possibly climb to the mountain-top, they must have been washed upon it while the mountain-top was on a level with the sea. We pondered this very much; and we put to ourselves the question, "What raised the island to its present height above the sea?" But to this we could by no means give to ourselves a satisfactory reply. Jack thought it might have been blown up by a volcano; and Peterkin said he thought it must have jumped up of its own accord! We also noticed, what had escaped us before, that the solid rocks of which the island was formed were quite different from the live coral rocks on the shore, where the wonderful little insects were continually working. They seemed, indeed, to be of the same material - a substance like limestone; but while the coral rocks were quite full of minute cells in which the insects lived, the other rocks inland were hard and solid, without the appearance of cells at all. we should certainly get drowned in them at last, even although we were such good divers! Nevertheless we did not allow his pleasantry on this and similar points to deter us from making our notes and observations as we went along. Geoff Cater (2009-2018) : R.M. Ballantyne : The Coral Island, 1858.